Today on the blog, I’m sharing my review of the Edison Robot. This tiny robot for kids is packed full of some absolutely amazing programs and features. If you are looking for an all-in-one toy to teach kids to code, I believe the Edison Robot has AMAZING value. The Edison Robot is full of awesome kids STEM activities that are perfect for a variety of ages. The Edison Robot can teach coding concepts that are simple enough for a four-year-old to understand (mine did!) or more complex for an advanced kid coder. What is the Edison Robot? The Edison Robot is a programmable coding robot toy for kids. 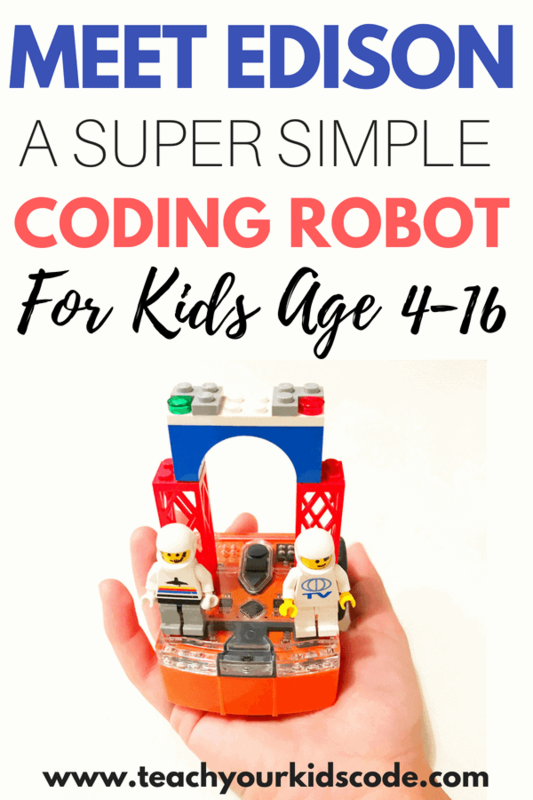 Designed as a STEM teaching resource for kids, this little robot is an awesome way to teach kids to code. It is a small robot, that fits in the palm of your hand, and it is packed with lots of powerful features. One of the best features of the Edison Robot is that it is compatible with LEGO bricks. 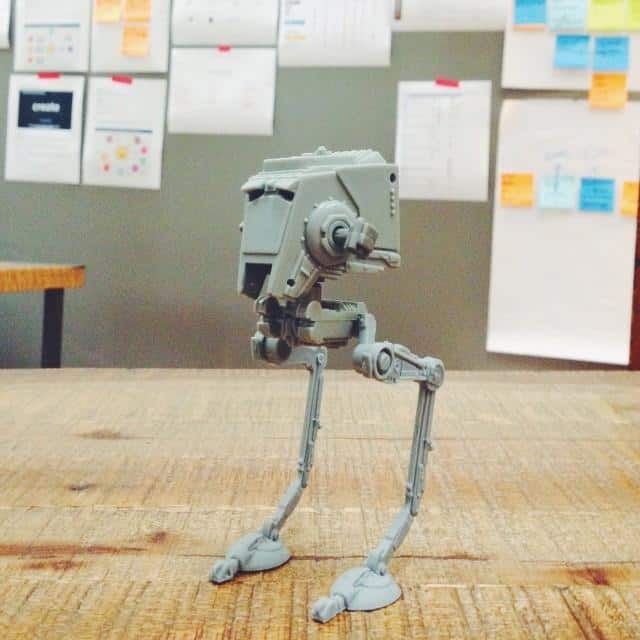 The first thing we did with our Edison Robot was to ‘design him’ with LEGO bricks. 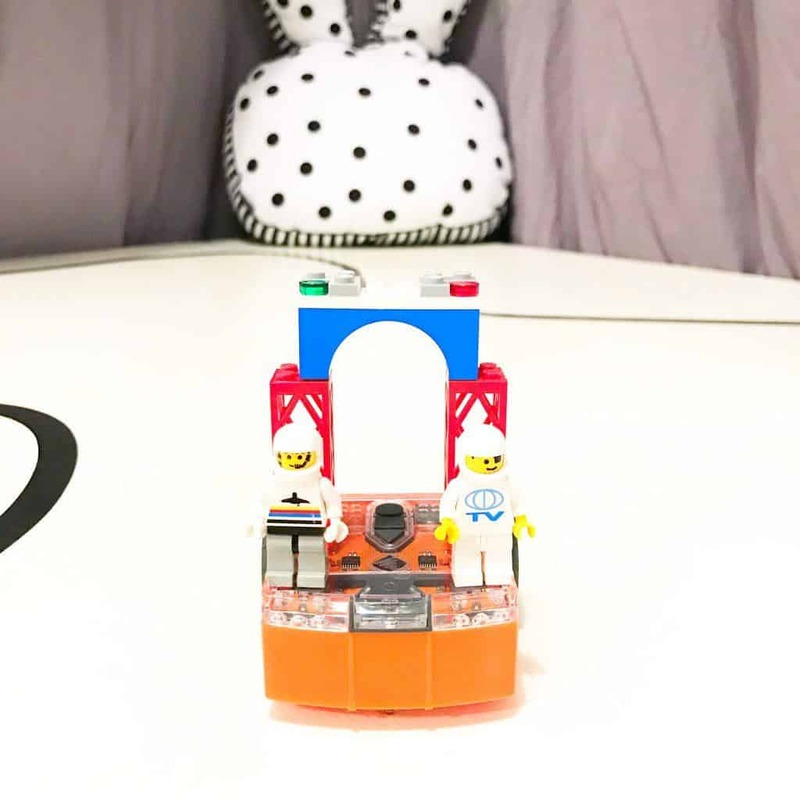 We are huge LEGO fans in our household so having the opportunity to create a unique ‘Edison’ was a big motivation to keep programming! Teaching kids computer programming and computational thinking comes easy with Edison. The Edison coding robot has a TON of really neat programs and capabilities. I am amazed that such a small (and affordable!) robot is capable of so much stuff! For starters, there are some simple programs you can teach the Edison Robot right away. These include programming the robot to follow a flashlight, avoid obstacles, follow a thick black line, and move when you clap. My 4-year-old was able to figure all of these programs out, and was SO EXCITED to watch his robot ‘follow the codes’. For older kids, more advanced kids coding activities are available. There are three levels of computer programming that Edison can follow, which allows for a huge variety in the difficulty and sophistication of the programs Edison will complete. 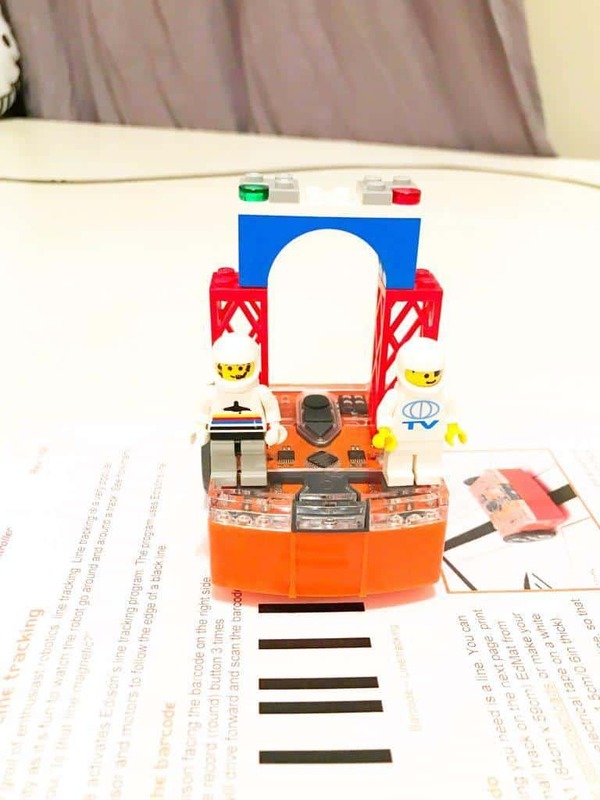 In addition, there is also an additional add-on construction robotics kit that can be purchased to turn Edison into a variety of construction machines. I love this feature! What age is the Edison Robot geared towards? According to their website, the Edison Robot is geared towards kids age 4-16. My son is age 4, and was able to enjoy a lot of the features of Edison already! I love that this toy is going to grow with him and can become more and more challenging as his computer programming abilities mature. As you can see below, Edison’s activities and capabilities are divided by age group with computer programming activities for each age group and kids coding level. What can you do with an Edison Robot? The Edison Robot has 4 levels of activities. Since my son is only age 4, we stuck mostly to the first level which includes Remote Control and Barcode programming. These were perfect for my son to learn the basic concepts of coding for kids. A really neat feature of the Edison Robot is that it can read barcodes to tell it what to do. This helps to teach the concept that the computer is learning a code even to little kids. Getting the Edison Robot to ‘read the code’ is simple. My son was able to do it himself once I showed him a few times. First, you line the Edison up in front of the barcode and then you press the circle button 3 times and Edison will move forward to read the code. There are different barcodes for all of the programs listed below. For this activity, you will need a thick black line. You can either print off a sample line from the Edison website, print the Edison playmat at your local print shop, or use electrical tape like we did. We designed a large electrical tape ‘road’ for Edison to track. You will need to make sure your electrical tape is on a white backdrop in order for this to work. For my son, the best part was definitely designing the road! Choosing a road and designing a path is a whole STEM activity in itself. I love that we can design different shapes and tracks to teach Edison whenever we want. Using the same thick black lines, Edison can also stay within your boundaries. Using another barcode, Edison will be programmed to turn around when he confronts a black line. What my son loved about this activity, was putting figurines in front of Edison and getting him to CRASH them! 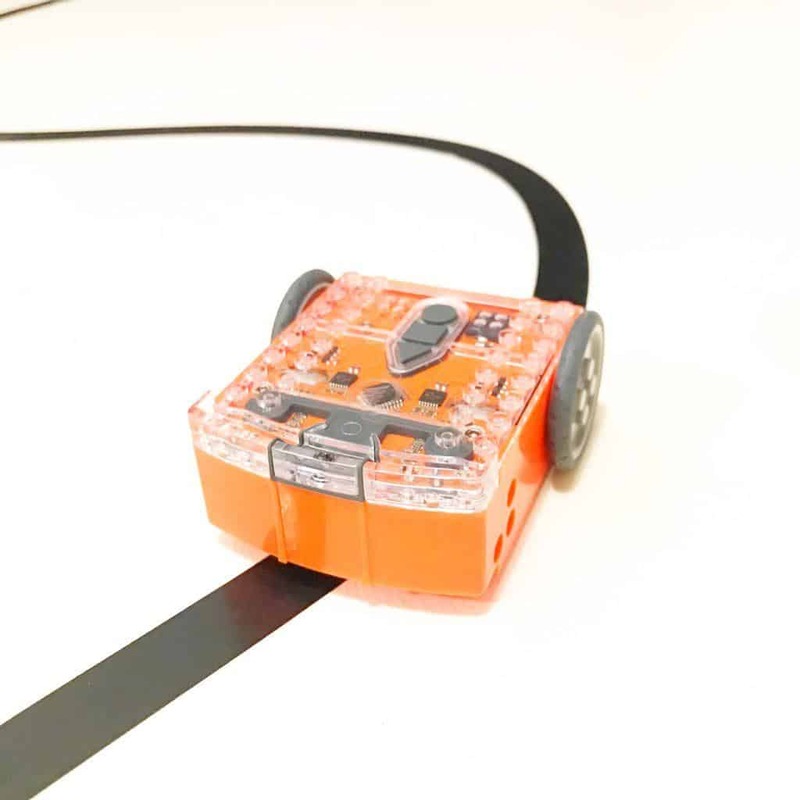 Put two Edison Robots inside a boundary and you will have a robot battle! I might just have to buy another one so we can use this feature! Clap activation is pretty freaking cool! It’s a great little party trick and my son thought it was wild! You clap once to get Edison to turn right and you clap twice to get Edison to move forward. Just this little activity teaches little kids the basics of coding. Kids have to understand that clapping once or twice is the ‘code’ and the Edison is going to perform something specific based on the instructions you give him. I would note that the clapping function was not 100% accurate. Edison didn’t seem to always understand whether my son had clapped once or twice. This could be a little confusing to little kids who can’t understand that why Edison isn’t following the instructions! I still thought it was pretty cool though! Following the flashlight is my son’s favorite Edison Activity. He loves using a flashlight in his closet, so this just added more fun to his regular favorite activity. Edison will follow a flashlight or torch in whatever direction you take him. You can set up an obstacle course or a maze and get your kids to take Edison on an adventure. So cool! In my opinion, this is one of the most genius features of the Edison robot. Instead of creating a bulky piece of extra equipment that is only used for one thing, the makers of Edison made Edison compatible with almost ANY TV remote. We all have TV remotes hanging around, so this was a great way to repurpose something we already had. I tried controlling Edison with 3 of the remotes that we had around our house and they all worked. Edison will work with over 75% of the current TV remotes on the market. Edison was good to go. Of course, my son just wanted to crash and bash Edison with all his other toy cars. We did put out some painters tape on the floor to make a pattern that Edison had to follow. This gave my son some motivation to work on understanding the directions he had to give Edison in order to get him to follow the line. Edblocks is a super easy visual coding language for the Edison Robot. Kids as young as 7 can learn to code with this simple language. You can set up challenges, mazes, and other activities to get your kids to be computer programmers in no time! Since my son is still little, I didn’t get the chance to try out EdBlocks with him. I did get a chance to log into the coding software and try out the basics myself. I love how easy to use the EdBlocks program is! It is very intuitive, which is also helpful for parents who might not be familiar with code. To see EdBlocks in action, check out the YouTube channel of the Edison Robot. Edware is a more advanced hybrid coding language for more advanced coders. This software still uses the same principles of drag and drop coding but has more advanced and sophisticated features. As an example, you can program Edison to react in a certain way depending on the presence or absence of a stimulus. In the code below, Edison will perform a specific activity depending on if a clap is detected or not. Since my son is a ways away from using this software, I didn’t spend much time exploring it. There are nice YouTube tutorials online to get started with this coding language. Edpy is the most sophisticated coding language for the Edison Robot. I seriously still can’t believe that the Edison Robot has THREE coding languages available, all included with one purchase. I truly think this product is the best value on the market to teach kids coding and computer programming. Edpy is based on Python, a text-based computer programming language that is used in a variety of applications. Python is known for being easy-to-learn and is a great place to start when learning a text-based programming language. By understanding Python, kids will have a world of possibilities open to them. It is possible to design your own apps and games using this coding language. The Edison Robot is available on Amazon for a great price! I seriously can’t believe how much bang for your buck you get in this one item. The Edison Robot has many more features than a lot of the other coding toy robots on the market. In addition to the base model, there is also an add-on extension pack to turn your Edison Robot into a construction vehicle. Since my son absolutely LOVES diggers, I can’t wait to purchase this and try it for myself! For some of the activities, an Edison Coding Mat would be helpful. You print this off write on the Edison Website! You can also design your own coding mat like we did with Electrical Tape. Have You Tried The Edison Robot? If you have tried the Edison Robot and want to share your experiences, please drop me a line in the comments below! 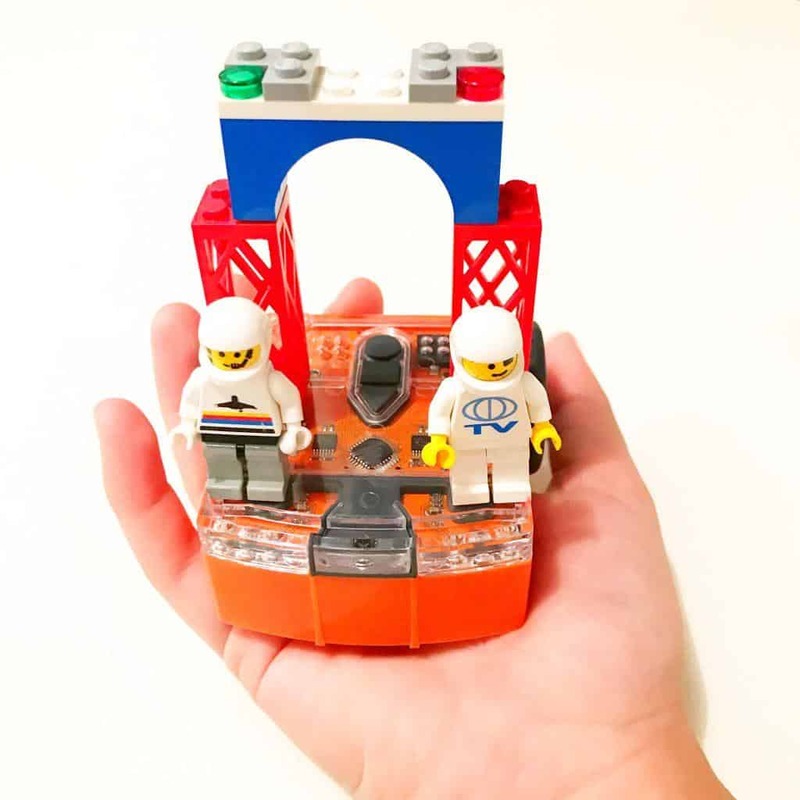 I hope that you got as much value as we did from this awesome little coding toy!